Everything about Café Margaux -- from the food and service to the atmosphere and wine list -- comes close to perfect. The newly renovated restaurant in Cocoa Village sets the bar for Brevard County. No review ever has taken longer to complete than this one. No restaurant in Brevard County ever has come closer to a perfect rating. The resturant in question is Cafe Margaux, now redesigned and reinvigorated after the closing of its much-praised but ultimately unnecessary adjacent steakhouse, Ulysses. Hail and farewell, Ulysses, but much of what gave people cause to love you remains at the parent venue, though some of that olive bread would be grand, as would the sauces. So too, chateaubriand. That Cafe Margaux has lost some of its heavy draperies and earlier decor has been much noted, and its new look still attempts to achieve continental classic, from the marble-walled, North African-looking Ulysses room to the “swan” chandelier. The point here, however, is as it always has been: the food. It is traditional-elegant with sparks of originality and that one great thing the discerning diner seeks: clear passion from those who invent its menus, prepare its fare and serve it, apparent at every turn. Soup of the Day ($9) — and I know of no better soup anywhere, and that includes Orlando — was a creamy manchego delight, lightly brushed with herbs and enlivened by Serrano ham: the perfect starter. The Child Gourmet was entranced. The appetizer was shockingly delicious; not something we normally would order, but a blatant attempt to be critical: a salmon terrine ($13) served with fine yogurt and excellent, crisp, country-style bread. Texture and flavor were light and right; exquisite. 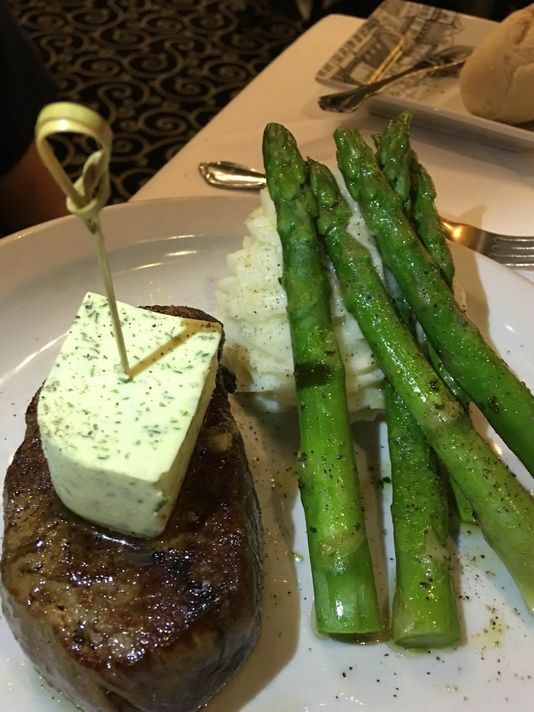 The entrees for the evening were predetermined: TCG is a connoisseur of fine steak, and so he opted for the center-cut prime filet mignon ($38) with white cheddar mashed potatoes and asparagus. I went for more of the same just because: wild salmon and chevre wrapped in phyllo with lobster cognac cream ($32). The steak was perfect, served with a fine-sized chunk of compound butter that overwhelmed nothing, and the vegetables and potatoes were eyed and consumed as a treasure by the young diner. The old one was well-satisfied by the contrast of the salmon, chevre and pastry. 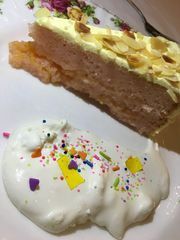 No chef in these parts does torte/gateau/cake like the master, Erol Tugrul, and he outdid himself with lemon and blood orange cake ($9) which was moist and tart-sweet. No, this was not the only meal we’ve ever have eaten at Cafe Margaux because, frankly, it required go-backs to be sure of consistency. It has that, inside or outside on the patio, for lunch or dinner. It also is untouchable for wine and spirits. If you want it, Cafe Margaux and its staff of sommeliers have it. No malt scotch was on the agenda that night for two very good reasons (child and car), but that special Laphroaig is there, and so are all things red, white and wonderful. Cafe Margaux also is highly respected for its wine dinners, and by “highly respected” is meant, “by the men and women who make, teach and sell wine, including at the Epcot International Food and Wine Festival.” Ask them. They know Margaux. On to service: It is unexcelled. Cafe Margaux’s servers could give lessons to nearly every restaurant in Florida in mattters from suggested sides to what-red-goes-best. Having said all that, why the delay? Well, in order to be awarded five stars, things must be absolutely flawless. In this case, the flaws were as minor as they get and did not involve food: a slightly chipped dish and kind of a battered fork; a Corelle plate. An example of a five-star restaurant, in these eyes, is Victoria & Albert, one of the country’s best, at Walt Disney World. Fix those minor flaws — and we have no doubt that it will happen wth ongoing renovations — and Cafe Margaux comes damned close. This restaurant sets the bar.